Worried about what will happen to your car insurance premiums after you get caught committing a minor traffic violation? 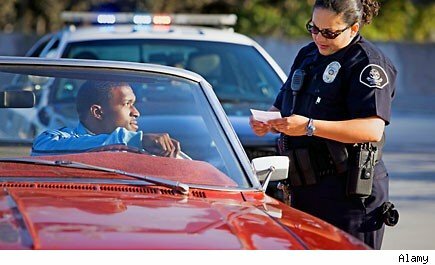 If you aren't getting traffic tickets frequently, then the results of a new study by InsuranceQuotes.com -- owned by Bankrate.com (RATE) -- may ease your mind. According to the study, in which drivers answered questions about their histories and premiums, most drivers, regardless of age, aren't paying more for car insurance after getting a traffic ticket. Only 31 percent of Americans who received a traffic ticket in the past five years saw their rates go up as a direct result. Of those 31 percent, most paid less than $100 more a year. Younger drivers, ages 18 to 29, were more likely to have a higher increase after a ticket, and 41 percent said they paid more as a result of a violation. 32 percent of 30-to-49-year-olds and 15 percent of drivers over the age of 50 also paid a slight increase. However, drivers with a history of repeated violations, or significant violations -- including driving under the influence, leaving the scene of an accident, and reckless driving -- almost always were charged higher premiums. The nonprofit Insurance Information Institute says increases in insurance premiums will depend on the type of moving violation. For example, going fewer than five miles an hour over the speed limit is considered a minor violation, and could result in a 5 percent to 10 percent premium increase. Going more than 30 miles an hour over the limit, or committing reckless driving offenses like passing illegally, failing to stop, and tailgating can lead to premium increases of up to 15 percent. Just how much will depend on the state the insurance policy was issued in, the driver's record, and the insurance carrier. Drivers with one minor moving violation can work to ensure their premiums don't go up by avoiding a second ticket, attending traffic safety courses, and keeping all registrations and inspections up to date. Also, some states have forgiveness rules. In New Jersey, for instance, carriers aren't allowed to raise rates for the first two-point speeding ticket (in most cases). And some insurers will forgive a minor violation for drivers with an otherwise clean driving history. Allied Insurance forgives one minor violation every three years without a rate increase, for instance. Nationwide offers an optional Minor Violation Forgiveness policy. Liberty Mutual and Progressive also offer customers similar options. The Massachusetts Office of Consumer Affairs and Business Regulation offers a guide to accident forgiveness that can be useful for drivers nationwide. All drivers, regardless of the number of accidents they've been in, can save money on car insurance by bundling policies, comparing rates regularly, and asking their existing provider for loyalty discounts and other price reductions they might qualify for. Motley Fool contributor Molly McCluskey has no position in any stocks mentioned. The Motley Fool has no position in any of the stocks mentioned. Try any of our newsletter services free for 30 days. You can follow Molly on Twitter @MollyEMcCluskey.